Today we showcase story of an exciting venture, from Melbourne & Sydney, Australia, Front Foot - Media Solutions for mobile phone and internet, co-founded by Anton Sher, Ben Astill, Richard Lennox. Front Foot started in April 2006 and we launched our first mobile site in January 2007. 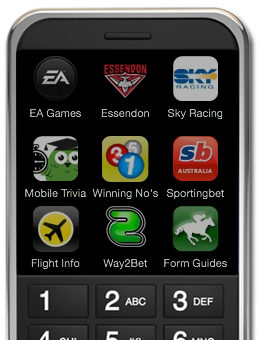 Since then we have built a number of mobile sites, including the Winner and Runner-Up at AIMIA's 2009 industry Awards for EA and Sky Racing respectively. Three years on and our portfolio is growing. We now have a mobile ad server, billing and alert systems, video platforms, and are integrated into Australian carriers. Currently Front Foot is looking at several export opportunities. Front Foot provides mobile solutions for all market sements depending on the business, brand, or site. Our core focus is on mobile, with our own sites built for niche segments that aren't fully catered for such as with our Flight Info, Traffic Info, and Winning Numbers sites. We have a strong background in Sport, Racing and Games which can be seen in our award winning work for EA, Sky Racing, as well as other clients such as Essendon FC and Sportingbet. We provide B2B and B2C products and services. Our customers include content publishers, telco's, ad agencies, and consumers. Our mobile solutions are powered by sophisticated proprietary technical systems that are best in market. This depends largely on the product and the clients objectives. We can tailor a broad range of marketing solutions ranging from portal advertising for carrier-integrated products, to strategic mobile ad banners for direct-to-consumer sites. We also utilise other digital mediums, all with the objective of providing clear and simple access to a mobile web page or site that we can provide detailed analytics and feedback on. This depends on the client. Financially the payback period for the majority of our clients are measured in months and on occasion weeks. Front Foot revenue models are varied. We are able to work on mutually beneficial terms that differ from client-to-client. It is important to be flexible. Even our own sites use different revenue models ranging from subscription, to advertising, and even a combination of both. With our clients we also have a mix of fee-for-service and revenue share. Various companies in different spheres. • How Much Money is Used/Reqd. Mobile site prices start at a few thousand $AUD and go from there depending largely upon scope, complexity, integration and support. Front Foot directors have substantial new media experience and are all tertiary educated in their field.